Great item. Exactly as advertised. Great knife very sharp blade. Pretty good pocket knife. Great grip, great edge, great pocket clip I would definitely buy another knife like this from copsplus. The knife also has a good price to it. 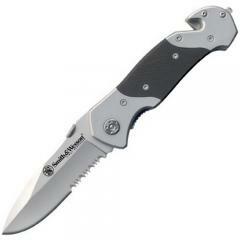 Sturdy & rugged One of the best "folders" Smith & Wesson manufactures in this price range. Accurately described and advertised. quality meets expectations. Thought it had a spring to flip open but it doesn't, my mistake. Still a great knife. Good beefy knife, not one to carry every day. Not real easy to open. Serves the purpose. Very good construction. Nice quality knife for the price. A very good knife I like the two parts of the knife that can help if you or someone are in a car. It's a good knife it's really heavy. This knife has a very nice weight to it. I'm very satisfied with it. Love it, well made, heavy duty, sharp. Does not come sharp, but after sharpening works great. This is everything that it says it is Very sleek and aggressive. Really refined knife. The reviews don't do it justice it is by all means an excellent knife.